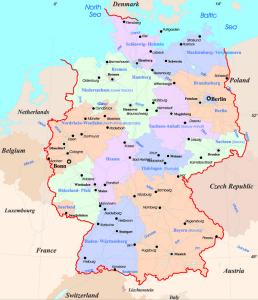 The Federal Republic of Germany is one of the world’s leading economic and political powers. With a population of around 82 million people, Germany is the most populated country in the European Union. Though relatively small in terms of physical size, Germany has long been a powerhouse in the engineering, scientific and manufacturing industries. From an economic standpoint, Germany has the world’s fourth largest economy by Gross Domestic Product. It is also the fifth richest country in the world in terms of purchasing power. The country boasts of an enviable standard of living and a universal health care system that is not only one of the oldest in the world, but also one of the best. Germany’s capital and most populated city is Berlin. Other major cities include Bonn, Hamburg, Munich and Frankfurt. Over the centuries, Germany has been home to some of the most famous thinkers, musicians, writers and philosophers of all time. The country’s rich musical heritage is encapsulated in the works of some of its most famous musicians, including Bach, Beethoven and Wagner. Numerous German painters and writers, including Matthias Grunewald, Max Ernst, Goethe and Gunther Grass, have won international acclaim for their works. German philosophers such as Immanuel Kant, Karl Marx and Friedrich Nietzsche too have had a tremendous impact on the world stage over the years. International shipping to Germany from the United States is a fairly straightforward process for those familiar with the import and export regulations of both countries. Numerous Germany international shipping companies provide affordable and convenient automobile shipping options between Germany and the United States. Most of these companies also offer services to help customers clear their vehicles through the customs and safety inspection processes in both countries. Most shipping companies offer customers the option of shipping their vehicle in a container or on board a roll-on roll-off vessel. Shipping a car to Germany in a container is a popular option because it allows customers to pack other belongings in the same container as the one in which their car is being transported. The average cost of shipping a car to Germany, or shipping a car from Germany to the U.S., in a container can range anywhere from $1,500 to $2,500. Of course, these figures depend on the city from which the car is shipped, its destination, type of vehicle, time of year and the type of insurance that is purchased. Another option for shipping to Germany is to use a RoRo vessel. In most cases, a roll-on roll-off option will be cheaper than container shipping. However, the actual shipping time between the two countries may take longer because RoRo vessels operate less frequently than container ships. Several major U.S. ports around the country including Tacoma, WA, Long Beach, CA, Galveston, TX, Baltimore, MD, and Newark, NJ offer RoRo departures. RoRo shipping options from the U.S. East Coast to Germany cost as little as $900, while costs for shipping from the West Coast start at around $1,200. In addition to the shipping charges, customers should also expect to pay customs duties, value added surcharges, and costs involved in safety and emissions tests in both countries.